I’ve added a few new pages to tvSmarter.com, hope you’ll check them out. Categories: Kids, Play, Society, Television | Permalink. Parenting used to be a much easier endeavor. Before the era of endless TV, parents just let their kids go outside and play. There was safety in numbers, and almost always plenty of kids outside to play with. Not anymore. Now, if you send you child outside to play, chances are he/she won’t find anyone to play with. The neighborhood kids are mostly hidden away, on the couch, watching the tube (with a bit of video gaming thrown in). Mike Lanza is doing his best to change all that (one neighborhood at a time). Lanza, the father of three boys, built the outdoor wonderland with a mission in mind. He wants children to rediscover the joys of playing freely outside, so he’s given all the kids in his neighborhood an open invitation to play in what he calls his “front yard family room.” And the play equipment in his backyard, which would make the White House’s youngest residents envious, also is accessible to all. Like many parents, Lanza, 46, looks back fondly on his own childhood spent playing with friends in the neighborhood – tag, pick-up football, hide-and-seek – knocking on doors to swell the numbers, and all the while untethered from parents. The key difference between then and now, he says, was the freedom children enjoyed. Along with creating the physical elements of a communal play environment, Lanza has been working to solidify a kid culture in the neighborhood – spending time with parents and kids, hanging out on evenings in the front yard, and throwing spontaneous potlucks for people to get to know one another. It probably goes without saying that the Lanza family doesn’t own a TV or any electronic games. Categories: Kids, Play | Permalink. Originally uploaded by Eric K.
Neil Postman, argues in his book “The Disappearance of Childhood” that the idea of childhood as a separate, innocent time for play and learning is very much a recent invention. In hunter gatherer societies children have plenty of time to play and also to learn naturally from older children and adults going about their business. But, as Postman convincingly argues, the Middles Ages (or the Dark Ages) was a very harsh time for children. Children were expected to work from a very early age, and work hard, and parents were free to do with them as they like. At age 7, they were considered to have reached the age of reason and were given the same sentence for any crime as adults (including hanging for theft). It wasn’t until the 1600s that the modern conception of childhood started to come about. Parents and community groups and churches opened schools and eventually playgrounds. During the Victorian Era especially, Children’s Literature thrived along with the concept of childhood as an innocent time for play and learning, to be protected from adult concerns. School nevertheless was often harsh, but was a huge step up from factory work and mining and the many other forms of child labor. Categories: Book Reviews, Kids, Play | Permalink. 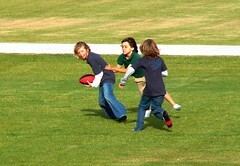 Excerpts from an article published in Scientific American Mind (February 2009) called “The Serious Need for Play“. Note, these are just excerpts, please click on the link to read the full, very fascinating, article. Free, imaginative play is crucial for normal social, emotional and cognitive development. It makes us better adjusted, smarter and less stressed. – Childhood play is crucial for social, emotional and cognitive ­development. 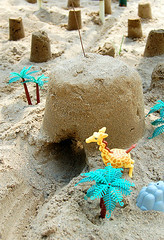 – Imaginative and rambunctious “free play,” as opposed to games or structured activities, is the most essential type. – Kids and animals that do not play when they are young may grow into anxious, socially maladjusted adults. “Free play,” as scientists call it, is critical for becoming socially adept, coping with stress and building cognitive skills such as problem solving. Research into animal behavior confirms play’s benefits and establishes its evolutionary importance: ultimately, play may provide animals (including humans) with skills that will help them survive and reproduce. Most psychologists agree that play affords benefits that last through adulthood, but they do not always agree on the extent to which a lack of play harms kids—particularly because, in the past, few children grew up without ample frolicking time. But today free play may be losing its standing as a staple of youth. According to a paper published in 2005 in the Archives of Pediatrics & Adolescent Medicine, children’s free-play time dropped by a quarter between 1981 and 1997. Concerned about getting their kids into the right colleges, parents are sacrificing playtime for more structured activities. As early as preschool, youngsters’ after-school hours are now being filled with music lessons and sports—reducing time for the type of imaginative and rambunctious cavorting that fosters creativity and cooperation. This creative aspect is key because it challenges the developing brain more than following predetermined rules does. 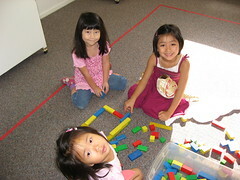 In free play, kids use their imagination and try out new activities and roles. Categories: Instead of TV, Kids, Play, Research | Permalink. Why do parents allow their kids to watch so much TV? Obviously part of the problem is that the TV/movie industry has been so incredibly effective at convincing most people (including parents) that TV is beneficial, educational, and at the worst harmless. But, I do think there is a deeper reason. And that is that throughout human history parents have, to a great extent, had a quite laissez-faire attitude towards their kids. After looking after their children’s physical needs, and making sure they do their chores, go to school, do their homework, children have been very much left to their own devices. And this has been a very good child-rearing strategy. Why? Because children know the secret of learning, which is to learn through play. Children have a powerful instinct for playing. So all those hours that parents allow them their freedom are not wasted, they are put to good use.